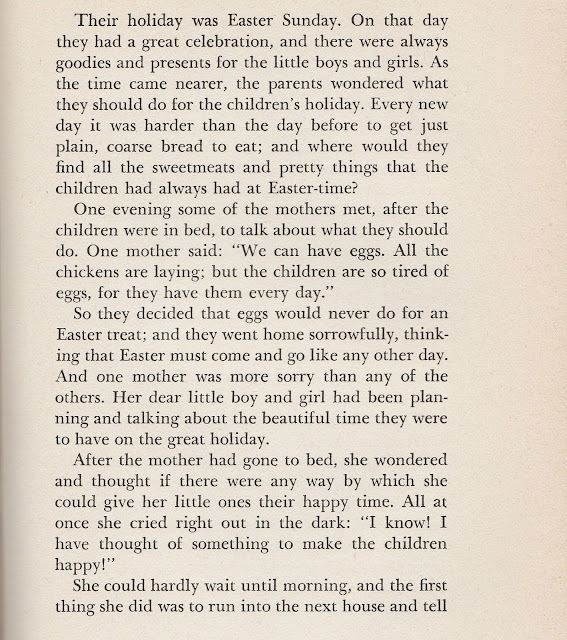 I promised an Easter story in the Keeping the Public in Public Domain series and it comes from the tellable works of Carolyn Sherwin Bailey (October 25, 1875 – December 23, 1961). Six times before this I've posted stories from Bailey's anthologies because they are so easy to tell exactly as she writes it. 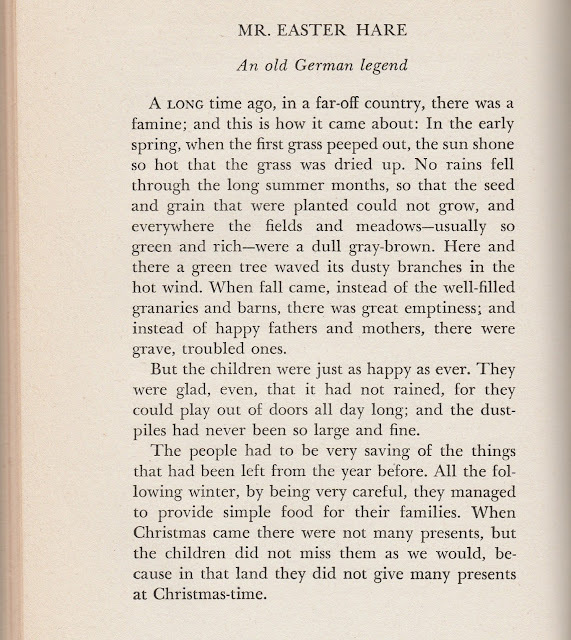 I'll say more after the story, along with suggesting a story that would partner well with it by yet another author, Madge Bigham, also mentioned here before with two stories from her Stories of Mother Goose Village. O.k. 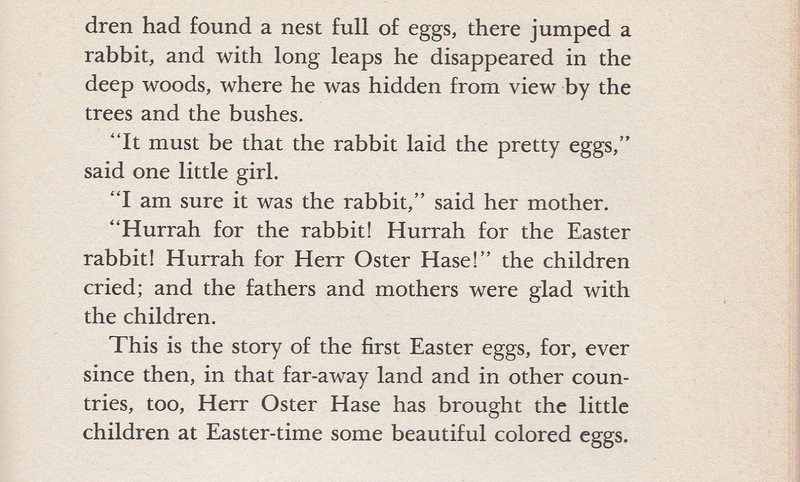 I won't give away the rest of the story, but the title of this German legend gives a clue that the Easter Bunny might play a major role. 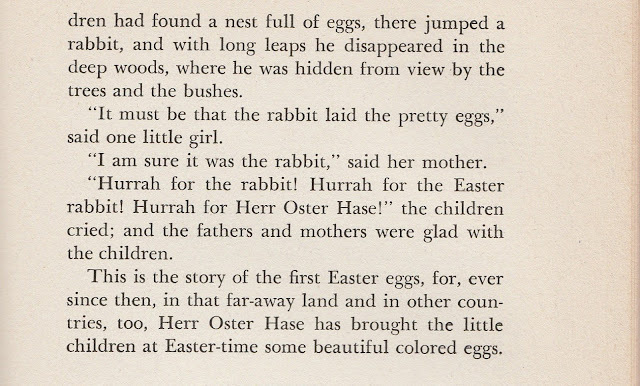 Before giving a bit of further information about the author and suggesting a story that might easily partner with it, I'd like to add a look at the symbolism of the Easter egg and possibly that rabbit. While the egg was associated with new life in pagan festivals, Christian symbolism points to the resurrection and Christ's coming out of the tomb. It's also said that the rabbit is a symbol of fertility, as in the phrase "breed like rabbits." Having raised rabbits long ago I'd say that's not very accurate. My Australian friends might disagree. The introduction of rabbits long ago for hunting went drastically wrong and they became an ecological nightmare. 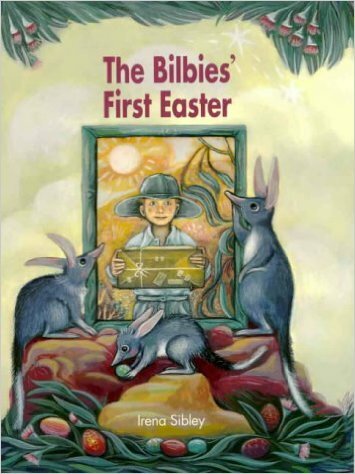 Instead Aussies point to a different long-eared beloved native creature, the endangered bilby, and have the Easter Bilby. I remember my friend, the late Aussie storyteller, Mabel Kaplan, first made me aware of it. 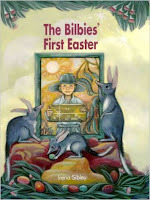 There's one book already and now there's an Easter Bilby website hoping to make yet another. Online I found History.com offered this look at Easter Symbols and Traditions, which mentions the German origin of the Easter egg as well as egg hunts, egg rolling, candy, and Easter parades. 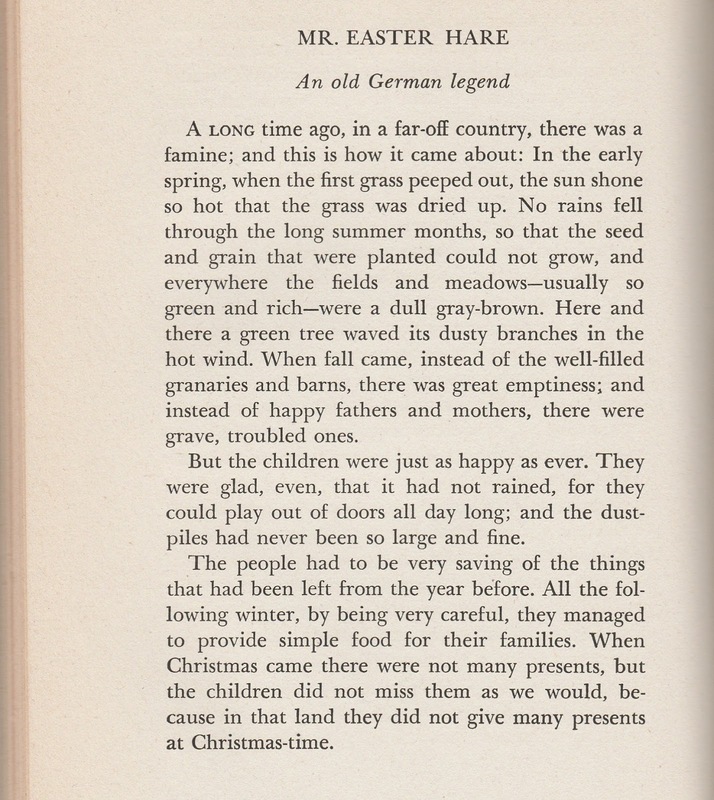 Returning to today's story, I recently learned a bit more about Carolyn Sherwin Bailey's long career from the language arts teacher's site, Book Rags. In their brief eight page study guide to Bailey's Newbery award winning, Miss Hickory, the author's biography points out her homeschooling for elementary school and how, even before she could write, she dictated stories to her mother. She published all her long life beginning at age 19. In earlier articles I attributed her background as a teacher, principal, and life-long writer to her dependably telling stories in a way that works with an audience. 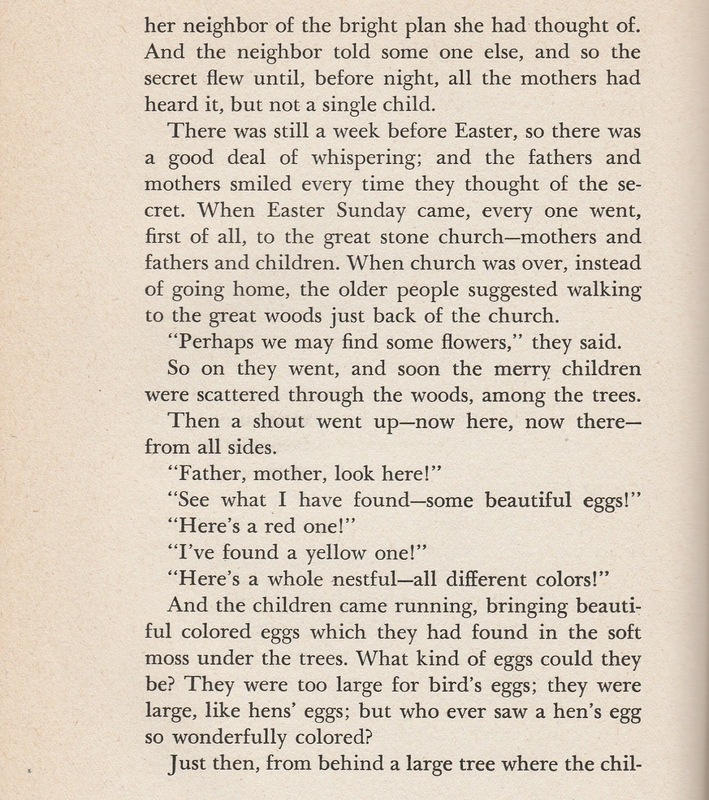 You could pair "Mr. Easter Hare" with the final story from Madge Bigham's Stories of Mother Goose Village, "Cinderella's Egg Hunt." Maybe some other year I'll give it, but the link above to the title at the Internet Archive, will let you read it now and decide for yourself. Earlier I posted two of Bigham's tales from Stories of Mother Goose Village, but will hold off for now as I thought audiences would snicker at some of the character names. She was welcome to name the children even if they didn't appear in a nursery rhyme, but I had reservations about Little Tee Wee, Curly Locks, Jumping Joan, Willy Boy, and Patchy Dolly. Then I looked at the back of the book where she lists the Mother Goose rhymes that inspired her. Didn't find any about the others, but I did find one I never knew about Little Tee Wee. Some of the characters are familiar names, like Jack-Be-Nimble and I love her inclusion of a young and slimmer child named Humpty Dumpty! Beyond the children there's Cinderella and I confess I wasn't sure about how yet again, like many stories in the book, Bigham sneaks her into the story. 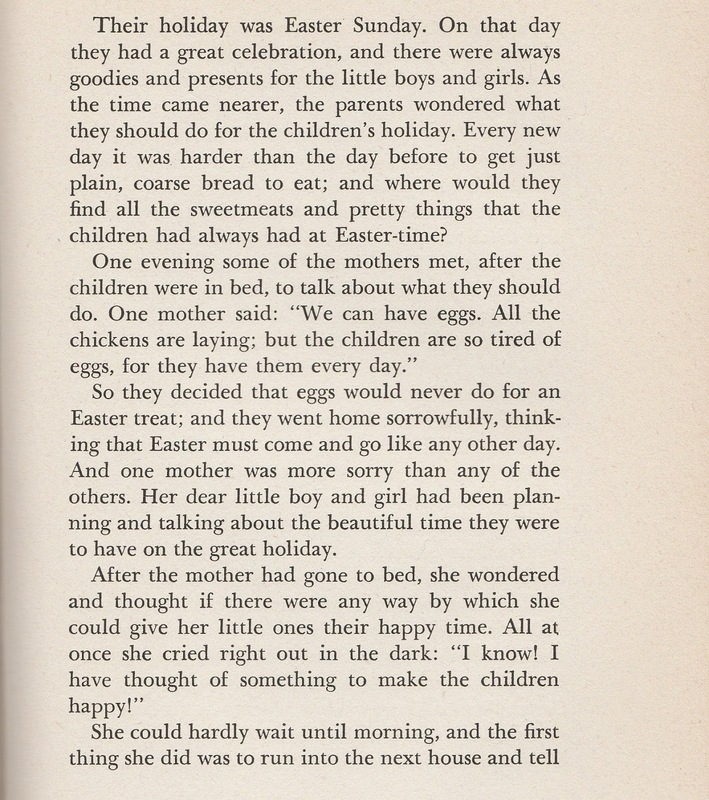 She gives a brief introduction to the princess, who in this story, with Mother Goose, sponsors the Egg Hunt. I was overlooking Bigham's use of Cinderella as a recurring character in the book. Earlier in the book her presence is explained as "Cinderella did not live in Mother Goose Village, though she often went there." Still, unlike today's stand-alone legend, all of this makes for a certain amount of handling on the part of the storyteller. I hope you often come here and even to my own storytelling, which is able to draw upon both folklore and history "as seen by the 'average' person." Whether from the Public Domain or not, this little known Mother Goose rhyme about Little Tee Wee will close this Egg-stravaganza. It's possibly sad, but good for concluding a session of Mother Goose rhymes.